Yemeni Foreign Minister Khaled al-Yamani, who heads the government's delegation to the UN-sponsored talks, told AFP his team would follow through with a planned prisoner swap with the Houthi rebels. "The Houthi militias must withdraw from the city of Hodeida and its port and hand it over to the legitimate government, and specifically internal security forces," Yamani said. Hamid Issam, a member of the team of Iran-backed Houthi rebels in Sweden, however, dismissed Yamani's role in the talks altogether. The talks, being held in the picturesque Swedish village of Rimbo, around 60 kilometres (35 miles) north of Stockholm where warring parties have to eat in the same cafeteria, have been months in the making and are slated to run for one week. On the agenda is Hodeida. 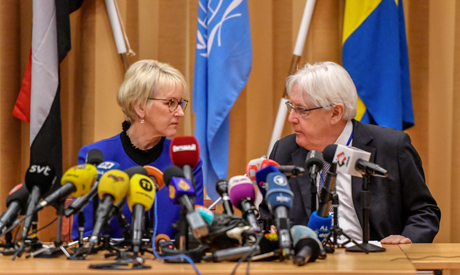 Not on the table are negotiations on a solution to the conflict between the government of Abedrabbo Mansour Hadi, based in southern Yemen, and the northern Houthi rebels, according to UN envoy Martin Griffiths. More than three years since Saudi Arabia and its allies joined President Abedrabbo Mansour Hadi's fight against the Houthis, Yemen is now home to what the UN calls the world's worst humanitarian crisis with 14 million people facing starvation amid war as a frail economy crumbles. Griffiths, the UN special envoy for Yemen, said the talks presented a "critical opportunity" but did not amount to negotiations on a full end to the conflict between the Iran-backed Houthi rebels and a rival government alliance led by Saudi Arabia. The head of the Houthis' political council, Mohammed Ali Houthi, threatened Thursday to bar UN planes from using the Yemeni capital's airport unless the talks led to its full reopening. "Unless the airport is opened to all our wounded and sick... then it will remain closed," said Houthi delegate Issam, referring to demands the rebels be allowed to evacuate more fighters for medical treatment.